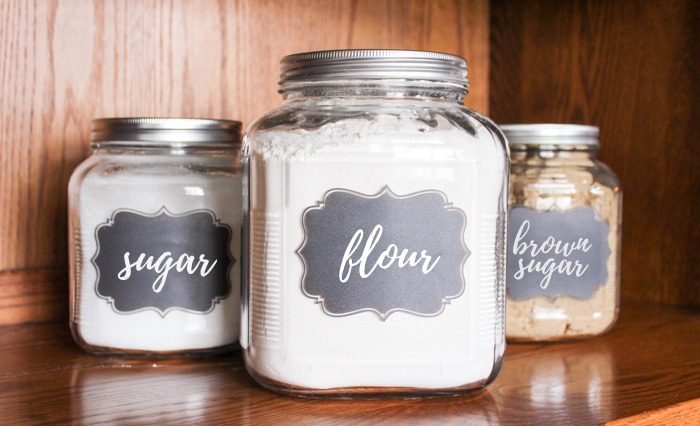 Make your own flour and sugar canisters when you buy large clear glass containers and use chalk labels! I’ve been using these for years! They are great for sugar, flour, brown sugar and other baking items. I’m sharing a DIY Mother’s Day gift idea with you! I’m of the mindset that anyone can DIY. You don’t have to feel like you’re super creative. 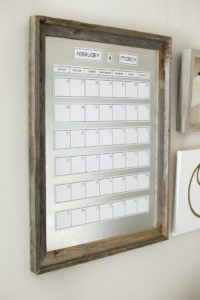 With so many wonderful tools out there today, there’s some great ways to put thought into a gift you’ve made yourself. And best yet, it will look good! Last year I mentioned my flour and sugar storage containers that I absolutely LOVE. As you’ve probably noticed around here I love to bake. Having a container to store my flour and sugar was necessary. I wanted it to look cute in my kitchen but I also wanted it to be functional. So many flour and sugar storage containers may look good on your counter, but it’s hard to measure from them. You want a wide mouth container to easily scoop out what you need and that’s not always possible. I spent a few years looking for the perfect containers, and when I didn’t find them, I made them myself. I’ve been using them for a little over a year now and they work great. They keep my flour and sugar fresh. Granted, I go through a lot of flour and sugar and that keeps them fresh as well. You’ll find that this DIY idea is perfect for the person who loves to bake. They have a screw top lid which I think is essential. Best yet, you can add one small detail to make them look custom. If you’ve traveled down the kitchen aisle at any store lately, you’ll see something exactly like these but that cost a lot more! I’m going to show you how easy it is to make these today! You can purchase glass canisters that are small, medium or large. I prefer the larger ones for flour. I purchased the medium sized ones for my sugars. You can find these glass canisters at any big box store. They’re priced between $4 – $7 which I think is a great price! If you love antiques, you can find these exact antique canisters in many antique stores for around $10 – $12. They usually have a colored lid. 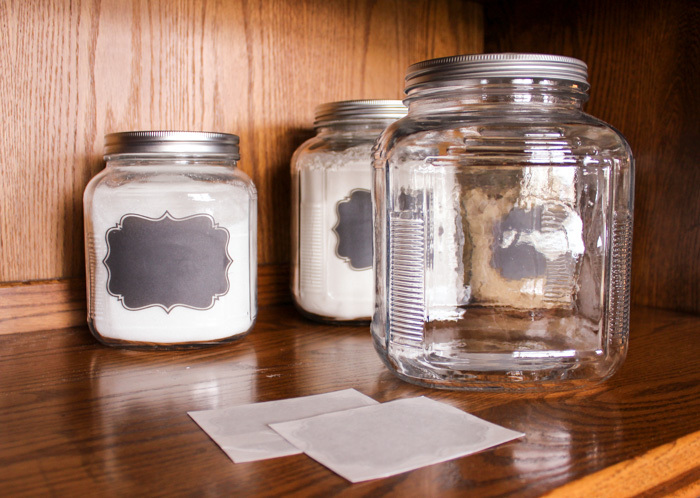 Besides the glass canisters you can find chalkboard paint STICKERS to place on the canisters. This truly is the reason why these are so easy to make. Did you think I was going to take out chalkboard paint and a stencil? Oh, no. 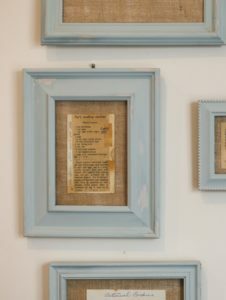 You can find chalkboard stickers in Hobby Lobby or other craft stores. If you don’t have a craft store nearby, Amazon sells them as well. I personally bought my stickers on Etsy a few years ago. I think it was a pack of 12 for around $8. I have used them over the years for cute little gifts like this. Seriously, it’s a STICKER. You’ll need to be careful when peeling the sticker but other than that, it’s pretty straight forward. I also recommend making sure the surface that the sticker is going to “stick” to is clean and dry. Once you place your sticker, you can move it a bit if you need to. I found the perfect spot and then rubbed it with a bit of force to make sure it wasn’t going to go anywhere. Like I said earlier, I’ve had these now for a year and they haven’t shown any wear. You can erase from the chalkboard sticker just like you would a regular chalkboard. I would just take care to not dunk the entire canister in water to wash them – it may un-stick at that point. That’s about it. These could not be more simple to make! You can make as many as you want or as few as you want. You can fill them with your favorite candy or with flour, like I did! Will you use these flour and sugar storage containers for a gift or keep them for yourself? Where did you find these jars? I NEED!! Hi Jess! I found mine at Wal-mart but it was years ago. More recently they’ve been on the shelves at Hobby Lobby in different sizes. These are exactly what I did with mine. I found mine at Hobby Lobby, both the jars and labels. I have 4, flour, sugar, brown sugar and tea bags/hot chocolate. I still use mine today! Glad you’re enjoying yours as well. Do you know where to buy the lids? I found a jar just like your flour jar at a yard sale but can’t find a lid. I found the jars at Walmart and Meijer. I would check there. Great ideas, very practical. 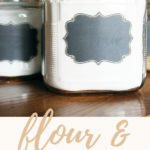 I love the idea for flour and sugar canisters. Looking forward to your newsletters. Nice! I just did this yesterday with some old gallon pickle jars I got for free. I spray painted the white lids with chalkboard paint I had on hand. I got a the chalkboard stickers at the Dollar Tree. Voila! Canisters. Can’t beat the price. Great idea! I’ll have to look for the labels at the Dollar Tree. That’s a great find!